Spiritual leadership at home is the ability to get my wife and kids to follow me as I follow Christ. Leadership is influence. When the kids are young it is training them to be obedient and shaping their character. When they are older, it is helping them to own their own faith and want to follow Christ. In both cases our ability to impact their lives is called leadership. There are 3 components to leadership: the leader, the follower, and the objective to be reached. The following diagram explains how leadership works. There are 3 parts to this process: 1) The leader must stay focused on the goal himself so he is modeling commitment to it. In this case the goal is being a fully devoted disciple of Christ. We must encourage men by letting them know that modeling is not about perfection, it is about direction. 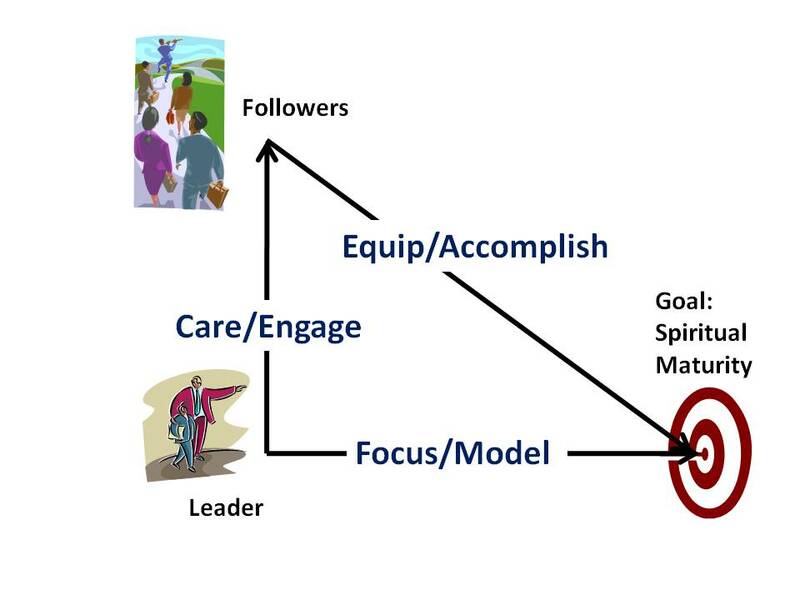 2) The leader must build a caring, meaningful relationship with his followers. Failure to do this leads to wounding our wife and children. 3) The leader must equip his followers and assist them to reach the goal of spiritual maturity. This leadership process is pictured below. To find out how Gary can inspire and teach your men to be effective spiritual leaders see the “Winning at Home” talks, seminars, and retreats. These messages give men practical steps to effective spiritual leadership. They learn how to avoid four relationship busters that block their influence in their kids lives and how to build close relationships that dramatically enhance their influence—7 principles based on Jesus example. They also learn 6 ways to equip their sons and daughters for living out their commitment to Christ in the world. This material in printed form is found in the FOCUS Notebook in our store.